For some reason this CD was very hard to get in Australia. I had to get it on e-bay. But it is quite simply one of the greatest live exhibitions of blues music I have ever heard- every song is simply brilliant. EC at his superlative best! The treatment given to "setting me up", with superb phrasing from both Eric & Albert Lee takes this little ditty to another level, and "Blues Power" has never been equalled. I owned this album on vinyl, & believe that it lost a little of it's edge on the CD. (I have a CD copy too). This album really does capture Eric at his finest, & puts his live performance at a level which other performers seek to achieve. It really is the yardstick for live albums. Just One Night is the best piece of music Clapton ever recorded. Every single note on this Album is absolutely perfect. On this Album are the best versions of "Blues Power" and "After Midnight" I have ever heard. Best mix for this Album is the MFSL Gold CD version. Just one Night is one of the finest live recordings Clapton has ever done. This album reflects where he was at this time in his career. He had just recorded Slowhand and Backless, and this album has songs from that time period on it. You also hear the influence of Dylan and the Band as Clapton does songs with Danko, Robertson and company. One of the songs is actually written by Bob Dylan. To me the beauty of this CD is the blues. If you want live blues this is the CD to listen to. Double Trouble, Ramblin on my mind, Cocaine, Further on up the road, and Worried Life are among the songs. If you are like me and you want to listen to live blues. let me recommend this to you. This is not the best era in Clapton's career, but the music on this CD is solid.. The best album I own, just piping Neil Young Live Rust....it is just so mellow...never ages....my no.1 desert island album. Excellent, amazing sound for stage, enormous talent and skill as guitar player for Eric. The BLUES in pure form and one of my best album to listen. Thank you from the bottom of my heart Eric Clapton. 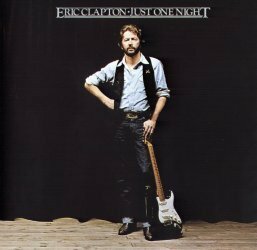 Generally regarded as one of Clapton's best live albums, "Just One Night" is an excellent summation of recent solo efforts such as "Slowhand" and "Backless". This is the first support group that EC actively assembled and interestingly enough it ended his decade long affiliation with American musicians as all the new recruits were British. Although guitarist/vocalist Albert Lee had been a member of EC's touring band since early in the year, the all-British band formally made their pubic debut at a concert held on September 30, 1979. Lee and keyboardist Chris Stainton were highly respected and well known musicians through associations with other artists ranging from Emmylou Harris to Joe Cocker while bassist Dave Markee and drummer Henry Spinetti were highly regarded session musicians with whom EC had worked on such projects as Paul Kennerly's "White Mansions" Civil War concept project and the 1977 Pete Townshend/Ronnie Lane "Rough Mix" colaboration. This album, recorded in early December at the Budokan Theatre in Japan captures Clapton and associates at the end of tour dates which saw them performing in Europe, the Middle East and Far East. Faithful renditions of late 1970's material such as "Tulsa Time", Wonderful Tonight" and "Lay Down Sally" were featured on this album which reveal the group to be a very tight and professional unit who could easily handle recent selections from the Clapton catalog. Apart from an unexpectedly flat performance of one of Clapton's favorite songs, "Further On Up The Road" and an awkward version of "All Our Past Times" which displayed none of the ramshackle charm of the original version found on "No Reason To Cry", this is a superbly produced and skillfully executed live set. Highlights include the B.B. King inspired reading of "Early In The Morning", a hard driving version of Bob Dylan and Helena Spring's "If I Don't Be There By Morning" featuring an excellent Albert Lee solo, strong guitar work by both Clapton and Lee on J. J. Cale's "Cocaine", a rollicking version of Mark Knopfler's "Setting Me Up" featuring Lee on vocals, masterful displays of blues virtuosity on "Double Trouble" and the medley of "Rambling On My Mind/Have You Ever Loved A Woman" and the finest versions I have ever heard of "After Midnight" and "Blues Power" which both date back to E.C. 's 1970 debut solo album. "Just One Night" would prove to be Clapton's last live set until the release of "24 Nights" in the early 1990's. This album is highly recommended. This was the first Eric Clapton album I heard. It is stunning. Double Trouble has on it the greatest of all guitar playing, subtle yet infinitely brilliant. What EC can do with a guitar is unparalleled by anyone and I mean anyone. Its like it's a different instrument he's playing, I mean how does he do that? If you haven't heard this album and you have ears and a CD player I suggest you buy it. The most successful live-albumof all time. EC had pick up a powerful band to made these dreams come true. Until now we still delightfully listen this album everyday. I think that if EC had a chance to play one more time, he could not have made it better. Just think of Wonderful Tonight, how beautiful his voice and guitar solo. Patty had made his lovely soul. Superlative Clapton. This record captures the blues genius of Eric with a clarity and precision like no other. His extended solos - particularly on Double Trouble and Blues Power - are simply faultless. Great band too - lean, tight, and propulsive! (Eric's greatest pick-up band?). "Just One Night" is perhaps the best solo Eric Clapton album. He plays an incredible selection of pure blues, his hits (albeit extended and made more interesting), and with Albert Lee some great country infused stuff. His playing is outstanding, I mean literally mind blowing - its that Clapton's genius to be captured on record, normally his studio solo's are more tame...but (and especially blues power) here is phenomenal. His voice is also at the stage where its becoming modern Clapton. Very powerful and confident. An outstanding album I can listen to over and over. This album is for me the best performance from EC. The sound is perfect, guitar solos are amazing (listen to Blues Power!) If I had one album to take with me on a desert island it would be that one.